Episode One, of my "All In The Family" reality show described how Eric Trump funneled funds into daddy Trump's foundation. See my June 18 post . 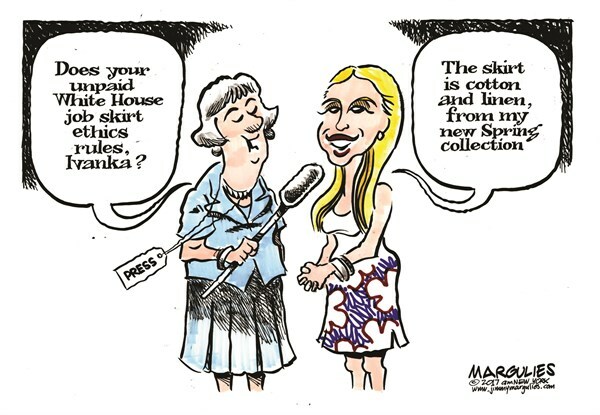 Ivanka Trump continues to follow in daddy's corrupt foot steps. This heart-warming episode describes how Ivanka has been accused of ripping off another companies shoe design. The apple doesn't fall from the tree as Ivanka described herself as the "Assistant to the President of the United States" and noted that she had an office in the White House. It was her hope that she would be immune from anything because her daddy needed her help, and she should be free from any lawsuits because of her position in the White House. Ivanka has really been busy these days, making deals with the Chinese to produce her shoes - and other assorted items - with sweat shop labor. People investigating how badly the workers were treated ended up in a Chinese prison, likely to never be heard from again. As in all the accusations, she simply lies about what's really happening with her fashion line, defying governments and courts that try to stop her.